D Matt Delahey (Regina, Chilliwack, 2004-10) signed a one-year contract with the Fife Flyers (Scotland, UK Elite). Last season, with the University of Saskatchewan (CIS), he had a goal and seven assists in 22 games. He was a CIS West second-team all-star. Delahey also was an alternate captain for Canada at the World University Games as Canada won a bronze medal in Granada, Spain, in February. 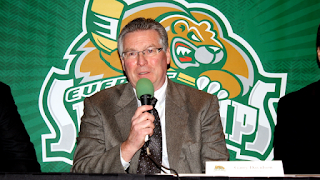 The Everett Silvertips have signed general manager Garry Davidson to a contract extension that runs through 2019-20. Davidson, 64, will begin his fourth full season as GM this fall. He has been the GM since Feb. 15, 2012, when he replaced Doug Soetaert. Prior to joining the Silvertips, Davidson spent four seasons as the director of player personnel with the Portland Winterhawks. Before joining the Winterhawks, he had been in the BCHL, working in Salmon Arm, Penticton, Nanaimo, Victoria and Trail. His last BCHL stop was Salmon Arm where he spent seven years (2001-08) as owner, GM and head coach. It’s interesting that during his time in the BCHL he became Enemy No. 1 in WHL circles. No one recruited harder than did Davidson and there were many people inside the WHL who detested him because of it. Now he is in the process of putting together an impressive run in Everett. In 2012-13, his first full season, the Silvertips were 25-40-7, finishing fifth (and last) in the U.S. Division and eighth in the 10-team Western Conference. In 2013-14, they wound up 39-23-10, tying for second in the division and fourth in the conference. Last season, Everett’s 43-20-9 record left it atop its division and second in the conference with what was the WHL’s third-best record. Nick Patterson of the Everett Herald has more on Davidson’s signing right here. Patterson’s story also includes an update on the seemingly never-ending saga of F Auston Matthews, an 18-year-old who continues to explore his options. “I know there's been a lot of speculation about Auston Matthews,” Gary Gelinas, the Silvertips’ president, said. “I can tell you that from talking to his agent, he was going to come to Everett until the U-18 (World Championship in April, when Matthews was named MVP) when some pro teams saw him. Auston has no issue playing in Everett. We were the first choice until the pro thing occurred, and we're still in the mix. A lot of the credit for that goes to Garry Davidson. Everett selected Matthews in the third round of the 2012 bantam draft, Davidson’s first as the Silvertips’ GM. Matthews now is seen as a possible first overall selection in the NHL’s 2016 draft. He is believed to have signed a contract with the ZSC Lions, who play in Switzerland’s top pro league, but is having problems getting a work permit. Were he to end up in Everett, his presence would immediately make the Silvertips a championship contender. Dan Shaughnessy of the Boston Globe dipped into the sports department’s old Rolodex — actually, the cards all are in a drawer now — and came up with a neat column. It’s right here. Got a tip or some information you feel could be useful to me, feel free to send an email to greggdrinnan@gmail.com. Trent Whitfield is joining the Calgary Hitmen as an assistant coach, filling the opening created when Brent Kisio signed as head coach of the Lethbridge Hurricanes. . . . Whitfield, 38, will work alongside head coach Mark French, assistant Joel Otto and goaltending coach Darcy Wakaluk. . . . Whitfield, from Alameda, Sask., retired as a player following 2013-14 and spent last season as an assistant coach with the AHL’s Portland Pirates. He played 16 seasons as a pro. . . . Whitfield played four seasons (1994-98) in the WHL, all with the Spokane Chiefs. The Tri-City Americans have named Rejean Beauchemin as the team’s goaltending coach, while adding Jerry Price as goaltending consultant. . . . Beauchemin, 30, replaces Lyle Mast, who is exploring pro options after three years with the Americans. . . . Beauchemin, from Winnipeg, played three seasons (2002-05) with the Prince Albert Raiders before going on to a pro career that ended after 2011-12. He has been working as a strength and conditioning coach and a goaltending instructor. . . . Price is a former WHL and pro goaltender who also is the father of Montreal Canadiens G Carey Price, who played for the Americans.